We have a place here that uses “secret sauce” on their wings. They also put the sauce on the fries too and it’s the bomb. You don’t need no ketchup for the fries. I loves it. I used to hit up the carry out after school when I was at Carroll. Awwww shucks. taht’s all i have to say about that! You are SOOOO wrong for posting those pics. Haven’t had wings and mambo sauce since Christmas Eve. Got mine off of Alabama Ave in SE DC. The wings were fried HARD!! LOL! I guess they know that’s how black people like their chicken. OH you have just made me so homesick. I’m in slower lower (Eastern Shore, Delaware area) and NO ONE around here knows about mumbo sauce. I can just taste it right now wit some fries. Dang, you brought back some memories for me. It was a place like that back home in TX called Rudy’s Chicken it was the BOMB!!! Now since I am in Chicago I might get a little Harold’s Chicken every now and then. But I have never heard of mumbo sauce. Those wangs look hella good. 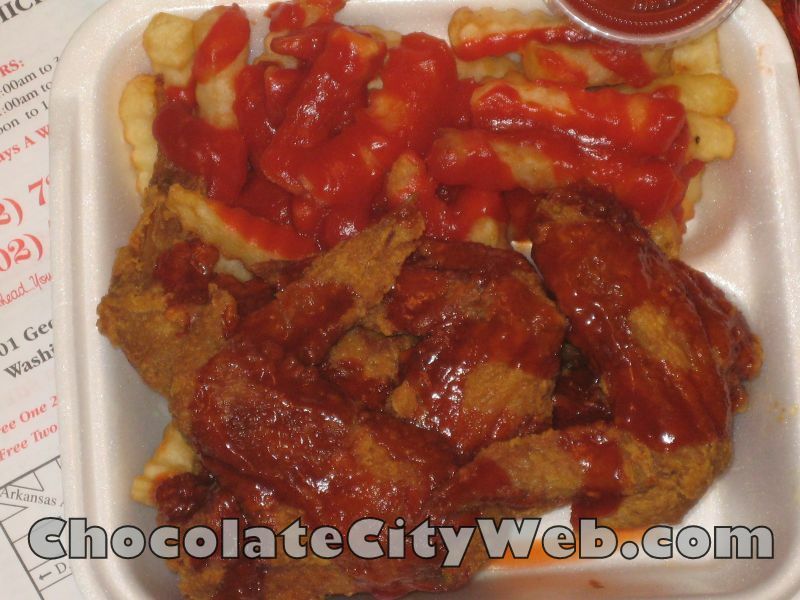 Never had Mumbo sauce but got me wanting to try it now!. I know I saw a bottle on sale( 2 for $3) in the grocery store last week ad I was wondering what the hell? Now I may have to check it out and give it a taste. and ROCK CREEK soda! my boyfriend was like, i know you from the hood because i keep a ROCK CREEK soda in the house…smh…too funny! 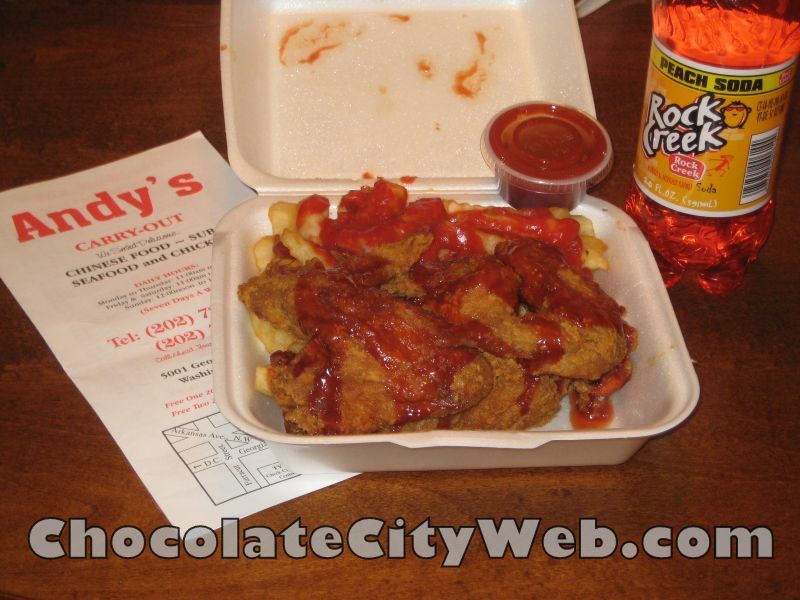 I got people in the DC ‘urrea’, PG County to be exact, and they introduced me to the wonders of Mumbo Sauce. They usually get their wings from Danny’s Carry Out I think. I like it. You can’t find Mumbo sauce to save your life down here in the A.
I’m a DC expatriate currently living in Brooklyn. And as much as I believe friedchickenwingsmambosaucefriessalpeppaketchup is part of the secret conspiracy to kill Black folk one clogged artery at a time (why come ain’t no kerrrryouts in the white neighborhoods? ), I can’t lie — that picture makes me wanna get on the New Jersey Turnpike right now and head straight to my old spot offa Georgia Ave.
yeah, i’m eating better these days but some days i do miss my fries and steroid chicken wings wit mumbo sauce from Yum’s! I just blogged on this!! Hot pictures… DC’s finest. “Evil” Danny’s on H Street NE. Fried hard. Some of the best in town. And they got gizzards, too. The sauce in your pictures is not the TRUE mumbo sauce. The color is too red and the consistency isn’t thick enough. That stuff is the cheap, knock-off, watered-down “mumbo” that has sprung up in recent years. 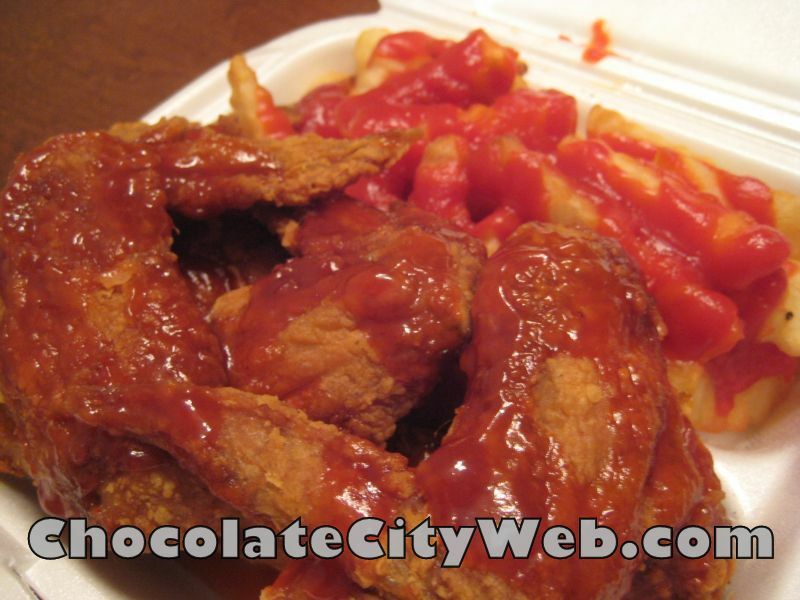 The true mumbo sauce is more orangish in color and has a thicker consistency like boiled-down duck sauce or something.